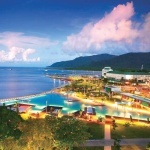 Cairns is the tourist, cultural and economic capital of tropical Far North Queensland. Cairns is a truly modern and sophisticated holiday destination which provides the ideal base from which to explore the fabulous natural wonders of the World Heritage Listed Great Barrier Reef and Daintree Rainforest. Staying in Cairns allows you to enjoy shopping at the many boutique shops as well as dining at a vast array of award winning alfresco restaurant, cafes and bars that are located in the city centre or along the picturesque Esplanade. At the Cairns Esplanade there is also a 4,000 square metre swimming lagoon that provides an ambient tropical temperature for year round swimming. Surrounding the Cairns swimming lagoon is tropical parklands and wide vistas that connects the Esplanade to the Cairns CBD and the Cairns Foreshore Promenade along 2 kilometres of timber board walks. This is the perfect place for a morning or evening walk and provides holiday makers with sweeping views right across Trinity Inlet. Cairns has a vast array of accommodation rooms available ranging from 5 star hotels and family apartments right through to budget hotels and backpacker accommodation. Couples, families and individuals are sure to find something to suit their needs in Cairns, including properties with sweeping waterfront views. Location : 50 minutes drive North of Cairns. Port Douglas is Australia’s premier resort town and it is the gateway to the oldest surviving rainforest on earth – The Daintree Rainforest. For years Port Douglas has been regarded as the most desirable holiday destination in the country because of it's relaxed atmosphere and picturesque tropical surroundings. The drive from Cairns to Port Douglas is one of the most scenic in the country, so be sure to take your time and enjoy it. Some of the highlights along the way include the Rex Lookout, wildlife parks, Oak Beach and Mowbray Valley. Holiday makers come from around the world to refresh and revitalise their lives, including heads of state, film stars and international tourists. The rejuvenation spas of the Daintree’s eco-resorts and Port Douglas resorts along with the crystal clear reef waters of the Coral Sea and the golden sands of Four Mile Beach combine perfectly to help bring about a sense of peace and tranquility. 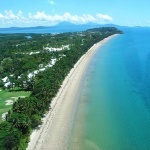 Port Douglas is positioned beside the sparkling waters of Dickinson Inlet and against the rolling waves of the Coral Sea. Everybody who visits Port Douglas should head up to Flagstaff Hill, which provides the best place to capture the magnificent views of the township and the lovely Four Mile Beach. Location : 25 minutes drive North of Cairns. 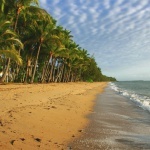 Palm Cove is Cairns most popular beach destination. Situated between the rainforests of the Great Dividing Range and the Great Barrier Reef, Palm Cove is the perfect accommodation for your next tropical beach holiday. Palm Cove accommodation ranges from 5 star resorts and hotels through to fully self contained holiday apartments. Whether set amongst the rainforest or overlooking the Great Barrier Reef the unique accommodation options available at Palm Cove combines perfectly with the fine dining restaurants and lovely safe swimming beach. Palm Cove has been careful not to become over developed and hence has preserved its relaxed ambience and made the most of its natural surroundings, which is highlighted by the 500 year old Melaleuca trees which line the beach front. Palm Cove is a sophisticated beach front village which is gained the title of "Australia's Spa Capital" due to its award-winning selection of exclusive spa resorts which offer the latest in spa and pampering treatments that are inspired by the natural surrounds. Location : 20 minutes drive North of Cairns. Trinity Beach is where holiday makers will discover the natural beauty of a magnificent palm fringed beach with year round swimming, temperate ocean waters and a peaceful village style atmosphere. Such a relaxed beach side location combined with the quality self contained accommodation will have you and your family coming back to Trinity Beach again and again. Ideally positioned in a protected cove and close to the World Heritage Daintree Rainforests and great Barrier Reef, Trinity Beach provides the perfect holiday hideaway that you have been looking for. At Trinity Beach you can go for a leisurely swim, sail, surf, windsurf or just relax under a shady palm tree. Today Trinity Beach has grown to become a sought after resort destinations, where visitors can relax in four and five star comfort. There is a wide selection of holiday accommodation in Trinity Beach to choose from including luxury resorts and for the family or longer stays fully self contained apartment accommodation with all of the facilites of home. Location : 10 minutes drive North of Cairns. The Cairns Northern Beaches stretch for 26kms along a sunny coastline and begins just at the northern edge of the Cairns city. Along the Cairns Beaches there are miles of pristine sand and crystal clear waters that are inviting you to swim, sail, windsurf or just simply sit back and read a book whilst sunbaking. The Cairns Beaches are made up of a number of separate beaches including Machans, Holloways, Yorkey’s Knob, Kewarra, Clifton and Ellis Beaches. Each of these secluded beach areas has its own separate township with a distinctive peaceful village atmosphere. There is plenty of space in which the children can play and easy access to the many tours and day trips to the Great Barrier Reef and Daintree Rainforest. These beach side towns provide much of Cairns’ holiday accommodation and holiday makers can choose from resorts, hotels, motels and holiday apartments. Water sport gear can generally be hired right on the beach and there are stinger resistant swimming enclosures at most beaches to give you protection during the summer months. Location : 2 hours drive North of Cairns. Cape Tribulation is a truly relaxing tropical retreat. It is one of the only places on earth where two World Heritage Listed living environments live right next to each other. Firstly there is the extraordinary tropical underworld of the Daintree Rainforest, and also the sparkling turquoise beauty and abundance of marine life in the Great Barrier Reef. 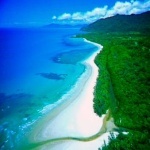 Cape Tribulation is ideally located in the heart of this unusual nature lovers paradise. There are a range of outdoor activities that one can partake in when staying in Cape Tribulation including rainforest walks, horse riding, scuba diving, snorkelling, four-wheel-drive trips, kayaking, crocodile cruises or simply relaxing on one of Australia's most beautiful beaches. The ancient forests of the Daintree area is thriving with native fauna and is filled with exotic plants bordering the waterfalls and clear jungle streams. In Cape Tribulation you will find a wide selection of holiday accommodation amidst the wilderness, offering private rainforest views and easy access to pristine Coconut Beach. There is also the famous mangrove broadwalk along which you can take a leisurely stroll in the mornings or balmy evenings. Location : 90 minutes drive North of Cairns. 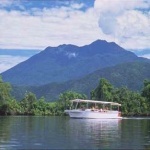 Daintree and the World Heritage Listed Daintree Rainforest beautifully showcases all of nature’s spectacular glory. The Daintree is renown as a 'living museum' of flora and fauna because of its vast array of wildlife that dates back to around 135 million years ago. The Daintree Rainforest covers an area of nearly 900,000 hectares of rainforest and tropical vegetation and has been on the World Heritage List since 1988. The towering forests of the Daintree are the oldest surviving rainforests on Earth and provide the perfect backdrop to a remarkable relaxing holiday experience. Visitors travel to the Daintree from the world over to feel at one with the planet and marvel at the wonders of Mother nature. The holiday accommodation in the Daintree region caters equally well for all styles and type of visitors. Backpackers will love the casual friendliness and the wealth of cheap and cheerful budget accommodation available, whilst families and couples can choose from a variety of luxury resorts, cabin retreats and apartment hotel accommodation. For the more romantically minded there is also a selection of private luxury lodges and secluded B&B hideaway retreats available. Location : 20 minutes drive North West of Cairns. 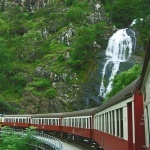 Over the years Kuranda has become a distinctive and popular visitor destination in its own right. There is the Kuranda Skyrail scenic railway that winds its way through the rainforest. Kuranda is also famous for having the biggest and most frequent art & craft markets in Tropical North Queensland. Four times a week the country markets of Kuranda delight holiday makers and tourists who like pick their way through the selection of craft stalls that are beautifully set amongst the trees. Kuranda is the gateway to the Cairns Highlands which has a character far removed from the beachside resorts. The Cairns Highlands has some of the best swimming holes, picturesque rainforest drives and interesting heritage sites amongst the mountains, rivers, lakes, and charming village style townships. The friendly locals in Kuranda are eager to share with you their love of arts, crafts, music and markets. The fertile rural landscape surrounding Kuranda provides great day touring options and Kuranda is an ideal accommodation base from which to start a remarkable self drive holiday experience. There are a great choice of scenic routes that criss-cross the Cairns Highlands as well as many opportunities for bush walking, bird watching, wildlife cruises, hot air ballooning and water sports including white water rafting and fishing for barramundi. Clifton Beach is where holiday makers will discover the natural beauty of a magnificent palm fringed beach with year round swimming, temperate ocean waters and a peaceful village style atmosphere. Such a relaxed beach side location combined with the quality self contained accommodation will have you and your family coming back to Clifton Beach again and again. Ideally positioned in a protected cove and close to the World Heritage Daintree Rainforests and great Barrier Reef, Clifton Beach provides the perfect holiday hideaway that you have been looking for. At Clifton Beach you can go for a leisurely swim, sail, surf, windsurf or just relax under a shady palm tree. Today Clifton Beach has grown to become a sought after resort destinations, where visitors can relax in four and five star comfort. There is a wide selection of holiday accommodation to choose from including luxury resorts and for the family or longer stays fully self contained apartment accommodation with all of the facilites of home.